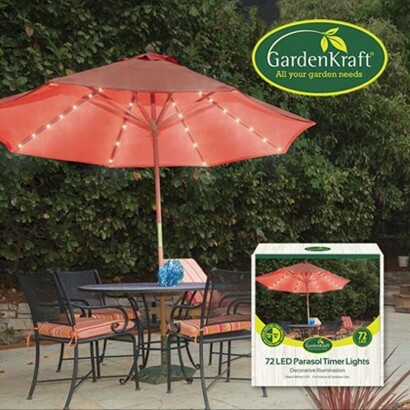 Subtle illumination for your patio, these decorative parasol lights line the spokes of your garden parasol for pretty summer garden lighting. With eight strings of nine warm white LEDs per string that spread from a central point on your parasol, these atmospheric LED fairy lights have eight functions; combination, in waves, sequential, slow glow, chasing/flash, slow fade, twinkle flash and steady on making them ideal for entertaining and relaxing. Battery operated, there's a timer function too so that they can be set to switch on at the same time every night.